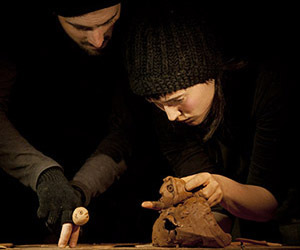 A Mano (By Hand) is a story told with clay, the story of a small character with a great desire to escape from a shop window and its inhabitants. It is a love story, a story about small failures, a potter's wheel, a cup that breathes, two people with great enthusiasm, a tiny pottery workshop and four hands that play. The Rioja's theatre company El Patio was born from a need to share with audiences different stories from everyday life that excite them, or they care about and deeply touch them. Those stories serve them as an excuse to seek out their own language to tell them on stage. A mano (By Hand) is their first show. It's been described as a small gift, a jewel, a delicious artisan-made play… 'a theatrical diamond like a tribute to an aging artisan in agony' in the words of journalist Jonas Sáinz. "A small size show but a real gem full of tenderness, sensitivity, poetry and charm. The manipulation of the puppets and the creativity on stage are extraordinary. 'A mano' should be seen and enjoyed by all people who love puppets and theatre creations made with love, talent and sensibility". "Moving, full of tenderness, humour, surprise, magic and sadness… A small wonder".